here this past year, complete with 4 out of 10 children. The Hogues have become an absolute staple in our community– our Downtown especially. Their food truck, The 5000, serves up artisan, Southewest-style street tacos, specialty fries, and the best dang grilled cheese on this side of the Mississippi River. 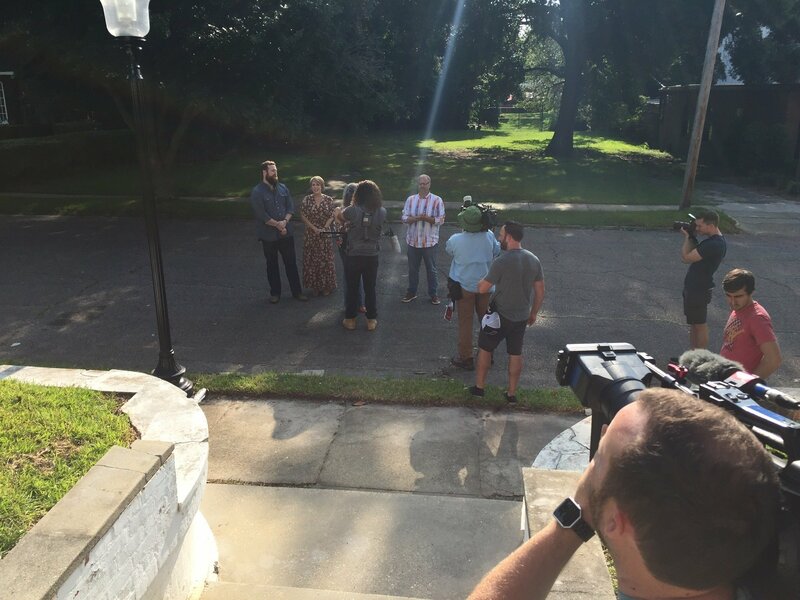 For this recap, we reached out to the Hogues for some extra tidbits on their Home Town experience! Throughout, enjoy some direct quotes from episode 2’s guest stars. The Hogue’s first requests included an old, stately Southern home and a big front porch. And I think we can safely assume at this point that they also need a pretty great kitchen, with Bill being a chef and all. Our first stop on real estate day is the Rockett House. Newburn and Emma Rockett lived in the home over 30 years, and Newburn worked at Laurel Machine and Foundry. One of our most historic companies in Laurel! The Victorian style home was built in 1903, and has lots of really neat, historic details on the exterior like a sunroom and a very intricately patterned screen door. Best part? It’s listed at $109,000. Way under budget. As they tour the house, it seems like there’s just not much there. Not great condition, but not bad. The whole thing was very charming, but didn’t seem very “stately”, as per Julie’s request. Although, the budget allows for some amazing Erin and Ben transformations and even some money left over, we’d like to wait and see. Best features: The incredible french doors in the formal living room/foyer space and the antique fireplaces. The Redd House gets it’s name from Roscoe and Lucille Redd, owners of Redd Music & Cigarette Company, who lived there for over 40 years. It’s a colonial home that boasts a build date of 1890. Wow! More brownie points for historic value. It’s significantly larger than the Rockett House, being 3,300 square feet with 4 bedrooms and 3 baths. Our asking price comes out to $169,000. Which is quite a lot more than the Rockett House! 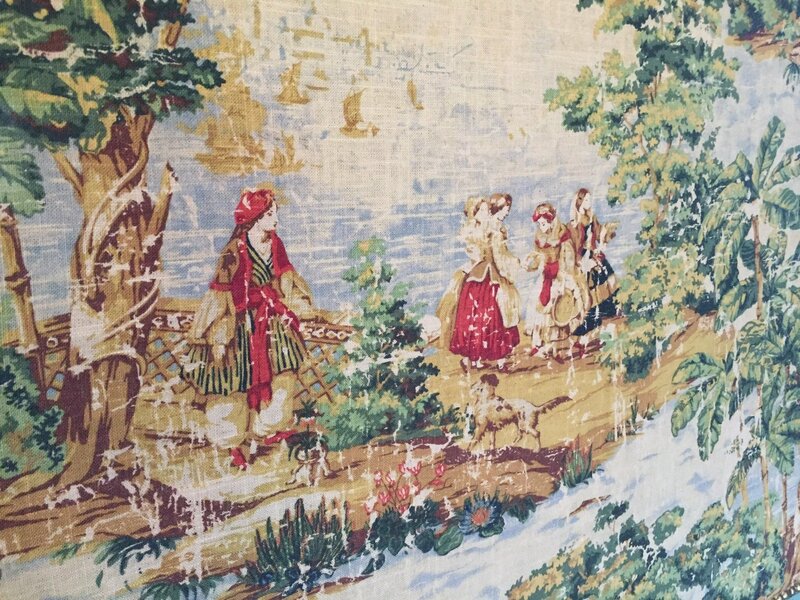 As we tour the home, we see some pretty interesting features scattered about. Outside, we see 2 concrete lions at the start of the sidewalk, upolstered walls, an iron raining inside, and most of all: beautiful fireplaces, grand staircase, and hardwood floors. Although we come in a bit over budget, we have high hopes for the Redd House becoming the Hogue House. Best Original Feature: The upholstered walls and wainscoting in the foyer. Before we go any further, we just have to say: this is one of our very favorite Home Town houses to date. 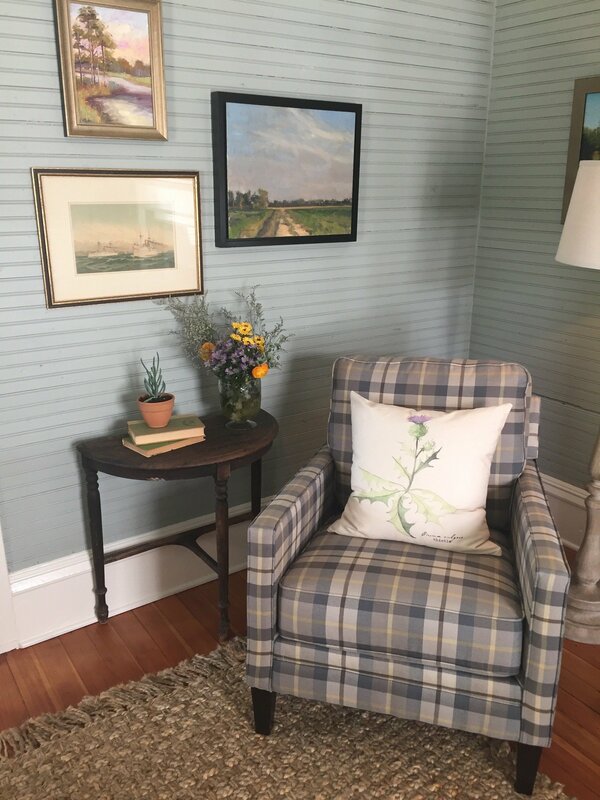 Erin and Ben did such a good job of incorporating personal touches to the family like including Bill’s grandmother’s clock and adding a chef’s kitchen, while protecting the original integrity of the home and highlighting the things that are reminiscent of Laurel. We were just over the moon about the reclaimed “Laurel” wood in the dining table and the Laurel bricks laid in the kitchen floor. Not to mention the uncovering of the bead board and keeping the “mossy” lion on the porch! And did you spot a couple of Lott Furniture Products? 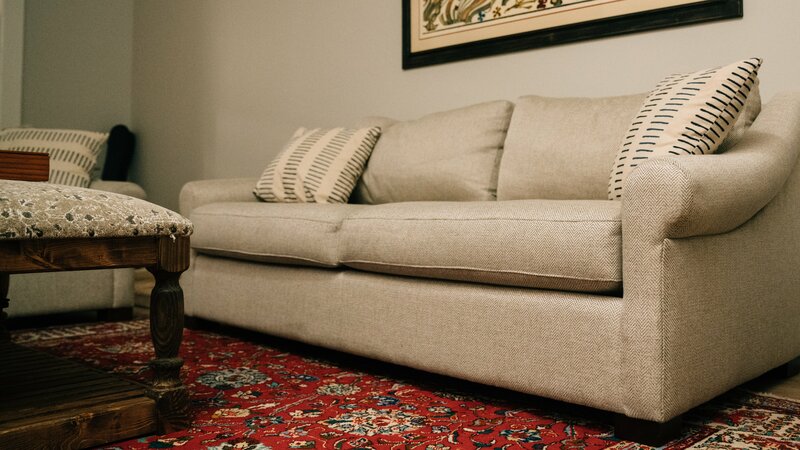 We can take credit for the fabric on their custom ottoman in the family room, and the charcoal arm chair in there as well. Enough about our favorites though, for a second. We took the time to ask the Hogue’s what their favorite room was that Erin and Ben designed! Lott Furniture Co. was lucky enough to gain the Hogues as customers, as well as friends. All thanks to Home Town! After the show, the Hogues stopped by our Design Studio to create some custom pieces for their brand new home. 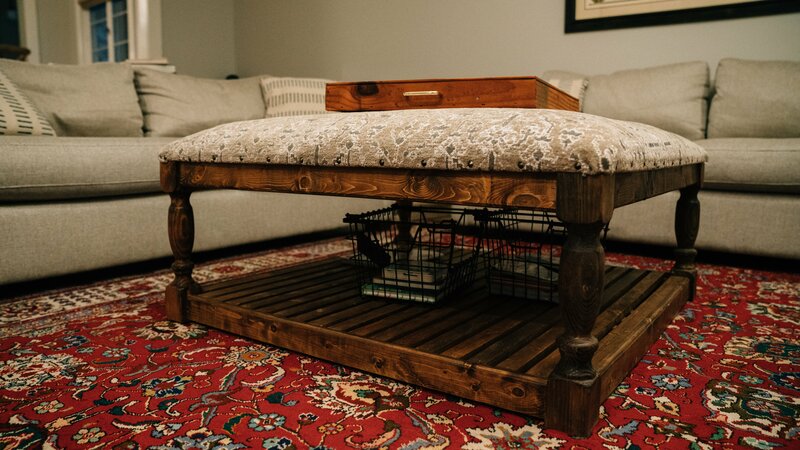 It was very special to us to get the opportunity to be involved with helping the Hogues find their perfect pieces to fit their style and needs, and most of all–to help bring them home. The Hogues chose 2 identical sofas for their living room, complete with custom accent pillows and stain/tear resistant fabric. 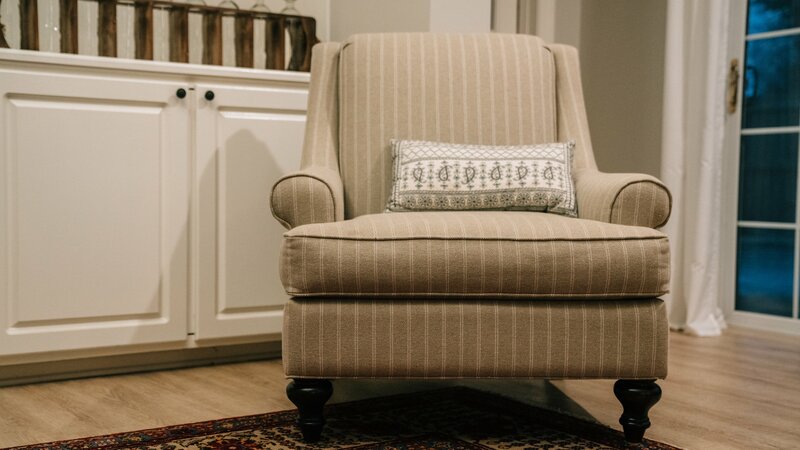 The most beautiful (and comfy) custom Bassett Chair. We selected a classic stripe for the Hogues. 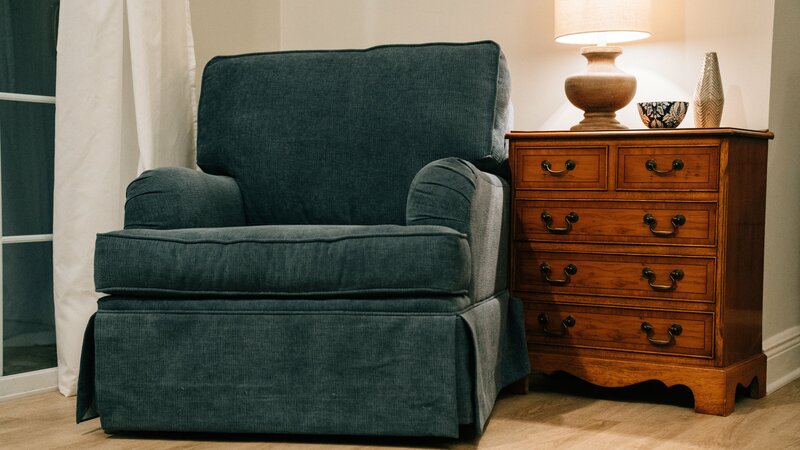 Our comfiest chair in our line. This one was made custom in North MS for Bill to rock in and watch TV. It’s great for the grandkids too! 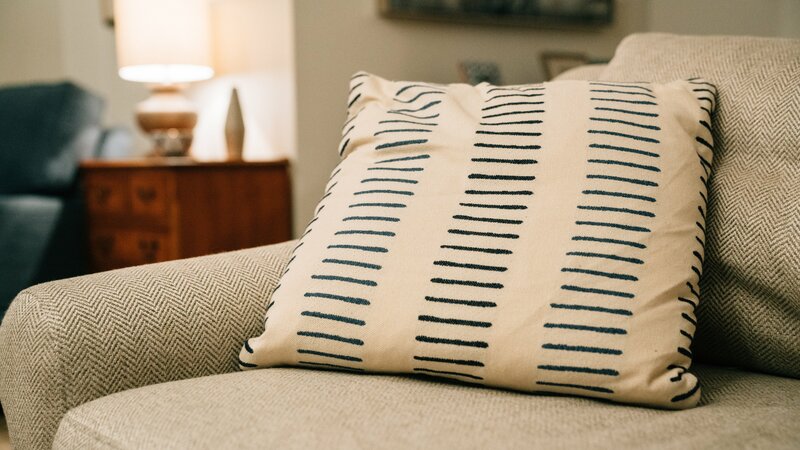 For something a little more fun, we selected a navy printed pillow to mix with the herringbone fabric on the sofas. Did you enjoy Home Town? What was so great about the experience? We loved participating in Home Town. We are not very talented in the area of decorating, so it was perfect for us. We were able to share our desires for the home, our color palate and how our family operates. After that – we were able to walk away and come back seven weeks later and see how this amazing team executed everything that was in our heads into real life. What would you tell a potential homeowner thinking about being on the show? Faith! You need to have a lot of faith in the team. I (Julie) know that giving up control is very difficult. It’s a daily struggle for me. However, its a once in a lifetime opportunity, and I don’t think it’s possible to ever duplicate that much talent in one room again. Erin, Amanda, Blake, Sarah, and Whitney (I’m so sorry if I’m forgetting anyone) are fantastic individually, but put them together and its the perfection. What do you value most about being a Laurelite? A sense of community. I love that we are in a place that we know so many people and our kids are known. We often will run into people that will tell us, “hey, we just saw your daughters at the store.” I love that our kids are watched after even when they don’t know it. We love feeling like we have been a part of Laurel forever. This is most definitely our “Home Town” and we are blessed beyond measure. Follow along and look for a recap blog every Tuesday throughout the season. Be the first ones to discuss the episode with us, and sign up in the gold box for email updates every time we post! What was your favorite part of this episode? What are you looking forward to this season? Let us know in the comments! -Haven’t seen the episode yet? 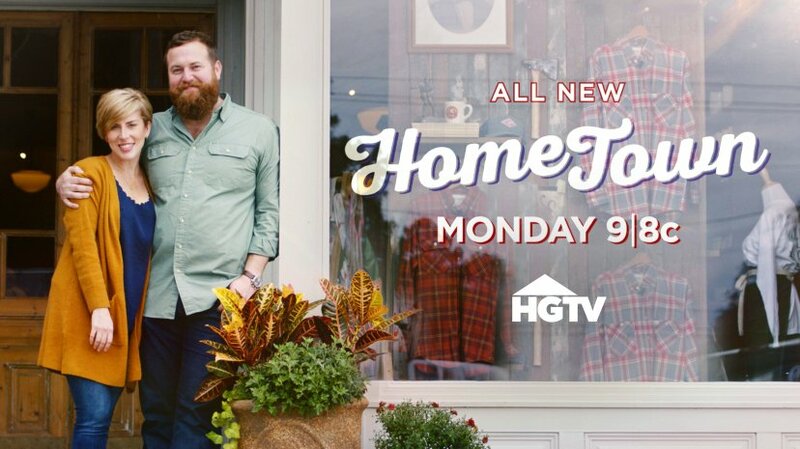 Watch for re-runs on HGTV, or visit their website or the HGTV app to stream the episode after airing for free. Not to mention, you can find exclusive content here like photos, videos, and the new digital series “Erin’spired” and “Talkin’ Shop” with Erin and Ben. We loved being able to visit Lott furniture while were there Thursday and Friday of this week! Beautiful furniture and friendly folks who were so accommodating even though we were just looking!!! Visiting Laurel needs to be on every Home Town fan’s bucket list!! !